I love riding my Mountain bike and want to share that passion with my boys. I am dedicating weekends to kid’s mountain bikes, to teach them to love the sport too. The sense of freedom and excitement it gives me has been amazing to experience through their eyes. Here are a few tips I’ve learned along the way. Dozens of companies produce kid’s mountain bikes. They often have suspension, brakes and gears similar to adult versions. 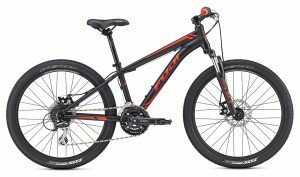 The kid’s bikes usually have either 20″ or 24″ wheels that will determine the overall bike size. Be sure to find the right size at your local bike shop. One big difference between riding around the neighborhood and on trails is the need to shift quickly and frequently. 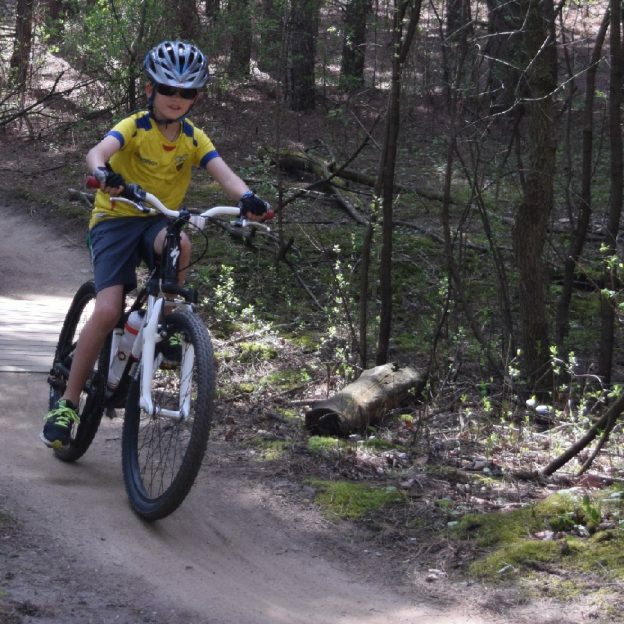 Most kid’s mountain bikes have between six and 21 gears with the higher gears being used on pavement and the lower gears for off-road conditions. 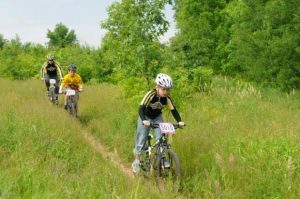 By teaching your kid(s) how and when to shift will them become more comfortable while riding over varying trail conditions. I find it is easy to teach this on the sidewalks in front of my home. Have your child ride down the sidewalk in one gear, then shift to an easier gear and ride on the grass back. By shifting between gears and conditions, kids can get a great feel for how the gears work. Stopping on kid’s mountain bikes is about balancing two things; stopping power and control. Most brakes can easily produce enough stopping power to skid the wheels, but when the wheels skid, you lose control. I found an easy way to teach this balance is to find a short but steep hill with a clear run-out at the bottom. Stand at the bottom of the hill as a safety precaution and have your kid head down. The first time down, tell them to squeeze the brakes (front and rear) as hard as they can. On the second trip squeeze a little less and feel the difference. Have them apply the front brakes more or more rear brake on each successive trip. After a little while, they will have a good feel for the way the brakes work. When kids learn to ride a bike they do so sitting down. While sitting is fine for smooth roads, it can become uncomfortable when riding over rocky trails. Try to teach your kid to stand while riding, using your legs to absorb bumps. You want to encourage them to have some bend in their knees and elbows and keep their weight back over the seat. This position lets them absorb all the rough terrain they might encounter. A fun trick to teach some skills involves nothing other than a board. A 1×6 piece of wood that’s about six feet long works best. All you need to do is set it on the ground and have the kids ride over it. Riding perpendicular helps them work on absorbing impact in the standing position while trying to ride along its length, helps teach control. A great part about the Board trick is that it gives a visual indication of where to ride without any penalty if they can’t stay on. Once they get comfortable with the standing position you will want to teach them how to get over objects. To start, find an object on the trail that might be challenging for your kid to ride over. Take a minute to show them where to ride to get over it. Have them back up, get a moving start, and take a run at the object. By standing over that object, you can be a safety net in case it doesn’t go to well. Reach out, straighten them out, and congratulate their try. If your trails don’t have a good place to practice this, you can build an obstacle with a pair of two by fours and some lengths of PVC (see picture below). Do your best to keep it fun. 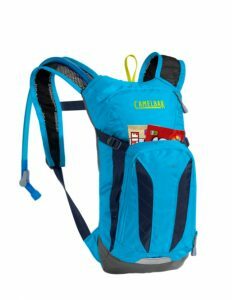 Pack treats, snacks and drinks and take a lot of breaks. If a section of trail was super fun, turn around and do it again. Keep the pace slow and have fun. If you meet a puppy, stop and pet it. Do anything you can to keep it fun and a big part of that is keeping it short. Rides over an hour can start to wear out new riders, and take some of the joy out of it. And regardless of the duration, be sure to encourage the things they did well. Kids are like politicians, in that they aren’t above bribes. I always take my son for a treat after the ride (our current favorite is a Smoothy from Wendy’s). This Pavlovian exercise can do wonders to reinforce the fun experience that is a mountain bike ride and encouraging the fun is the most important part. 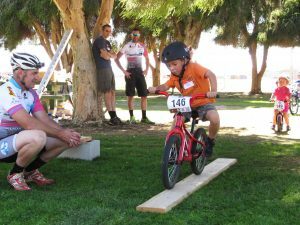 This entry was posted in News and tagged family mountain biking, IMBA, kids bikes, MBT Lessons, MBT Maneuvers, MBT Tricks, Mountain Biike, mountain bike tips for kids, NICA on September 1, 2018 by John Brown.